Corporate companies around the country have an unwritten rule in celebrating native festivals. A mail from the HR would hit our mail boxes asking us to come to work in "Traditional attire". Traditional attire literally translates to Veshti + Shirt for men and Saree + Designer blouses for women. For men, this gives an opportunity to see their female colleagues in Saree; but women do not have the same happiness because they end up seeing the veshtis falling down more often. 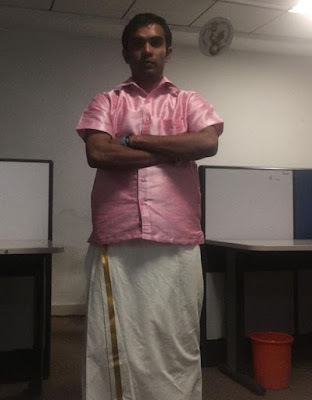 Yesterday, we had our Pongal celebrations at my workplace. As always, we were asked to be in traditional wear. I wore my Pink Jingli Shirt and Pattu veshti. To give the authentic Tamil touch, I wore pattaapatti underaayar inside. I am not gonna post a picture of me revealing my pattaapatti underaayar because I don't want to lose a few more followers for this blog. A women colleague came to me and asked " Why are you in pink? Is not that a lady's color?" I did not know what to answer her. I never knew that pink has become a private property for the ladies. So I went close to her and whispered in her ears "What makes you think that I may not be a girl?" in Tamanna's voice. She took four steps back, gave me a dirty look and walked away. This picture exactly depicts my current state of mind. There is a dustbin in the corner of the picture. One side of me has light and one half of me is in darkness. Now don't come up with conspiracy theories stating that I belong to Illuminati. 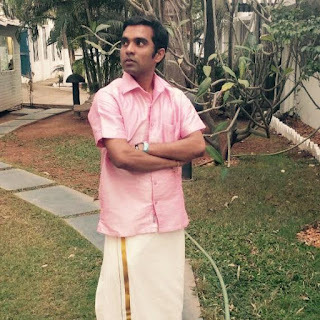 Yes, My Veshti fell too. But who cares. It has already fallen many times in the past. At least I had my pattapatti costume underneath. 13 years ago, I did not have a pattapatti underaayar. I have gone through worse situations and that has made me a soranai illaadha jeevan. On other news, Party workers have asked me to preside over jallikattu celebrations. When I was in deep thoughts one party worker clicked the below picture. Apart from presiding over the function, I will also participate as an Aam Aadhmi and chase the bulls. That is not a pink jingli shirt.... That is a Vadivel dubai shirt... N i am pretty sure u posed so many times before u got the 2nd pic... Aama dhaane Chris? :P U shud have asked that judge judy lady for her lipstick as well.